Bionic eye implants, devices designed to restore sight to completely blind people, are now arriving on the European market. It should not be long before they are approved for the U.S. as well. This is a huge step for medical technology, and could dramatically change a lot of lives for the better. So far the implants, developed by Second Sight, are only capable of restoring sight from blindness caused by a faulty retina. For around $115,000, patients can undergo a 4-hour operation to install an antenna behind the eye and a pair of camera-equipped glasses that send signals to the antenna. The antenna is wired into the retina with 60 electrodes, which create the equivalent of a 60-pixel display for your brain to interpret. According to the first bionic eye users, they can track the movement of objects, make out rough shapes, and slowly read large writing. Aside from Second Sight, there is another implant undergoing research that may begin trials soon. This one is the Bio-Retina, developed by Nano Retina. This one will apparently cost about $60,000, and rather than an external camera, a vision-restoring sensor is placed inside the eye on top of the retina. The 24×24 resolution implants 576 electrodes into the optic nerve, where an embedded image processor converts the data into electrical pulses that are coded in a way that allows the brain to perceive various levels of greyscale. This procedure only takes about half an hour and a local anesthetic is used. 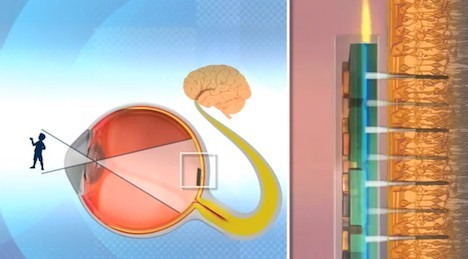 Trials for Bio-Retina will likely begin in 2013, and if the success rate is high, it may also be on the market soon. Research groups are still working to develop bionic eyes with even more electrodes and higher resolution, but it’s still could be a while before color images are developed from equipment like this. However, with groundbreaking progress like this already reaching the market, and a high demand for more, who knows what we may see in just a few years.